Watching a deer nurse is something else. The fawns use their snouts to “punch” her underside which I guess helps release milk. It’s hard enough that her back legs lift up sometimes. She’s not fazed though. She had three fawns. Looks like there’s just two left now. A few weeks ago I caught a fox with a baby deer in its grasp. The baby was crying so loud I ran outside and startled the fox, who lost his grip and the two ran fast (unbelievably fast!) back and forth in wide circles in front of me. That baby could run! and it was about half the size of these here. It did eventually get back to its mother who was eating someone’s bushes across the street. That’s a disadvantage: herds of deer that pass through and consume, on a daily basis, all vegetation in their path. Oh, and these deer aren’t like Bambi. They’ll charge you if you get too close. I took this photo through the screen, very surreptitiously. If I went outside the mother would have approached me stamping her feet. I should make a list of all the animals I’ve seen wandering along the pipeline: fox, skunk, wild turkey, possum, ground hogs, racoon, and the regular rabbits, squirrels, chipmunks, voles, snakes (that make tasty treats for the owls, hawks, and vultures). It’s a pipeline ecosystem. I wouldn’t be surprised to see a bear. And you can see how closely spaced the community is! This entry was posted in Uncategorized on July 19, 2017 by Bix. Oh Bix, wonderful photos! And I’m so glad you saved that baby! Why do animals wander along the pipeline? We have it too, just in the process of being built. I hate that they did it in spite of massive local protests…. I don’t know what it is about deer, but they love a path. They love to follow the leader. And the pipeline clearance is one great path, it stretches across the state. I’ve never seen deer nursing, wonderful pictures! 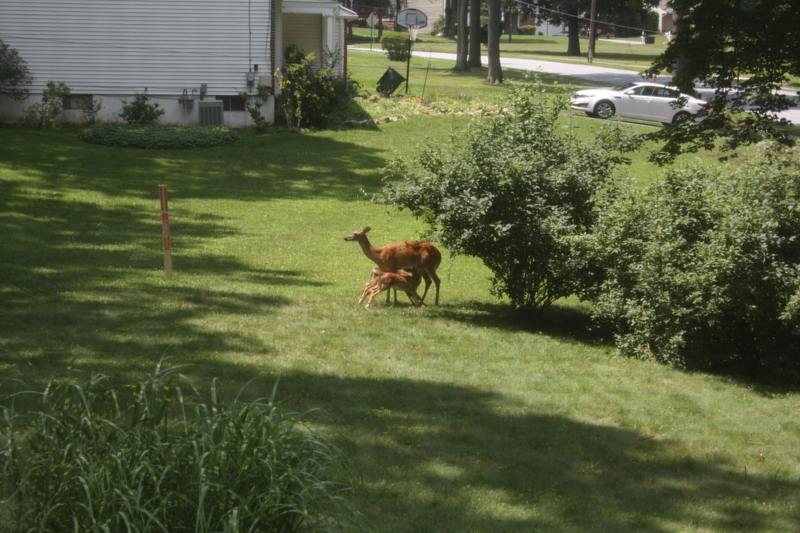 We have deer wandering through our backyards (nibbling on various greens), and there have been mothers and babies but not nursing. Enjoyed seeing these.